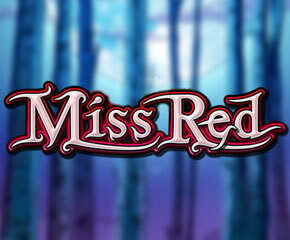 Miss Red is a video slot developed by IGT that is available for online players also. 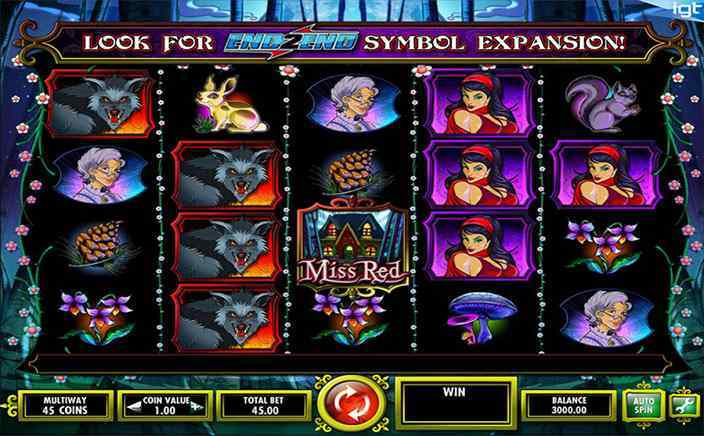 Covered in a mysterious shroud, this slot is themed around a lady dressed in red living in a haunted and dark cottage located on a hill. Just spin the reels and you might be able to unlock some mysteries around her. Having a backdrop of a dusky forest, this slot has 5 reels and 1024 ways in which you can win with expanding wilds, free spins, wild symbols and some special features such as MultiWay Xtra. The coin value ranges from 1.00 up to 50. The maximum bet available is of 2,250 coins. Inculcating the characters from classic tale Little Red Riding Hood, which seems to be a bit mature and provocative, the slot is quite interesting. The details relate the theme to a great extent. The symbols include Miss Red herself and her cottage, Toadstools, Granny, Poisonous Flowers and some Woodland Creatures. The big wolf roams the whole area. Miss Red and the wolf are expanding symbols. The symbols which get caught between two wolves will get turned into a wolf. Only the Ms. Red won’t be changed. You can have some instant wins if you 3 wolf symbols match on a single payline. This symbol is found to be regularly triggered and will also reward the wins which were present before the transformation. Five to fifteen bonus spins can be won through this round. The bonus event named Granny’s Free Spins Bonus gets triggered when the 3 symbols of Miss Red’sCottage appear on reels two, three and four. You will have to then choose one of the baskets having flowers and fruits through which the amount won via free spins will be determined. You can re-trigger more free spins if you get at least 3 Miss Red Cottages. Free Spins up to 280 can be kept on retriggering. The feature named MultiWay Xtra can provide you with some decent wins. This symbol only pays when a symbol matches another symbol in the same column. This symbol pays for all the directions that are from left up to right, right up to left, and for centre three reels. With impressive graphics, the slot features a return to player percentage of 96.16%. Although it is a bit expensive to play, still it manages to entertain the players completely. This slot is lucrative and a creative venture full of action with an intriguing twist to the storybook tale.